The Alchemical tradition goes back hundreds of years in Europe—and even farther in India and the Middle East. While Alchemy was, on one level, the quest to turn lead into gold, and was quickly disproven and replaced by modern science, there was another, deeper Alchemy. That was the quest to turn a human being into an enlightened sage, and its proponents created artworks that veiled their philosophical and allegorical system underneath the metaphorical imagery of technical alchemy. Although lead-to-gold alchemy may have (mostly) died out, speculative alchemy has influenced contemporary artists, writers, dramaturges and filmmakers ever since—alchemical imagery pops up in everything from Freemasonry to Surrealism. 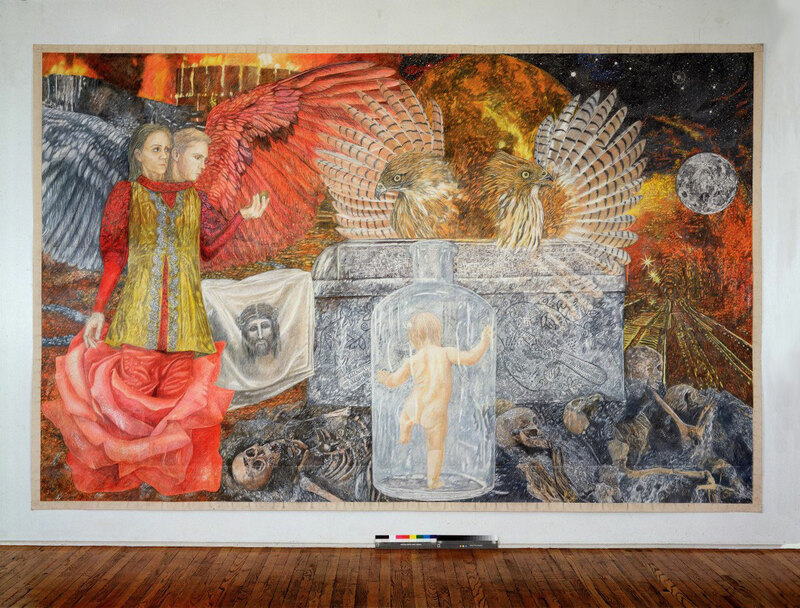 As interest in esoteric arts has only increased in modern times, a lot of contemporary artists are continuing to work in the alchemical tradition, both honoring the ancient tradition and updating the images and metaphors for the modern world. 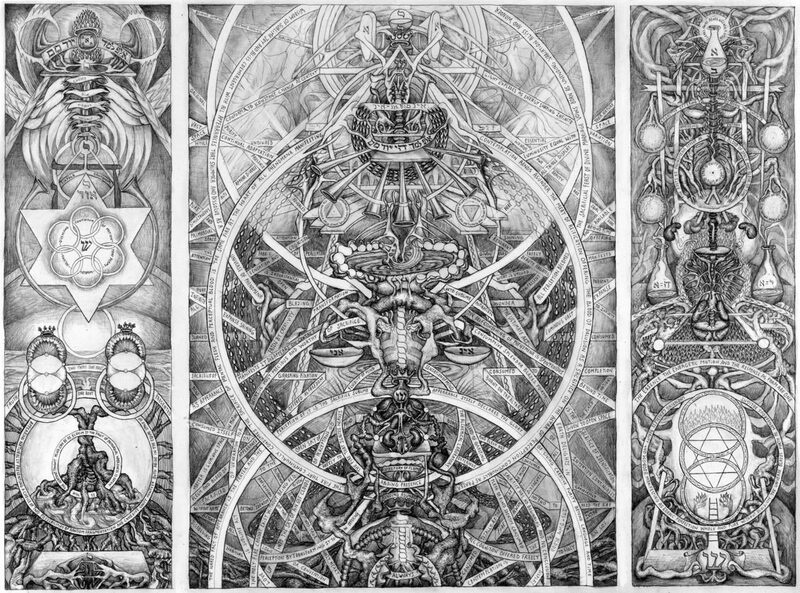 David Chaim Smith (see his site here) is a New York-based artist that creates massive pencil-and-paper artworks inspired by the Qabalah, the Hebrew system of understanding the divine through numbers and letters. His works go far beyond the standard Tree of Life diagram you’ll find in nearly any occult book, sourcing both orthodox Rabbinical texts and an almost Cronenbergian “body horror” that turns the Tree into living biology. For more, check out his magnum opus “The Sacrificial Universe” from Fulgur Press (the above image is from that book), his commentary on Genesis 1-2 “The Kabbalistic Mirror of Genesis”—which will also be published in a more affordable paperback from Inner Traditions this Fall. 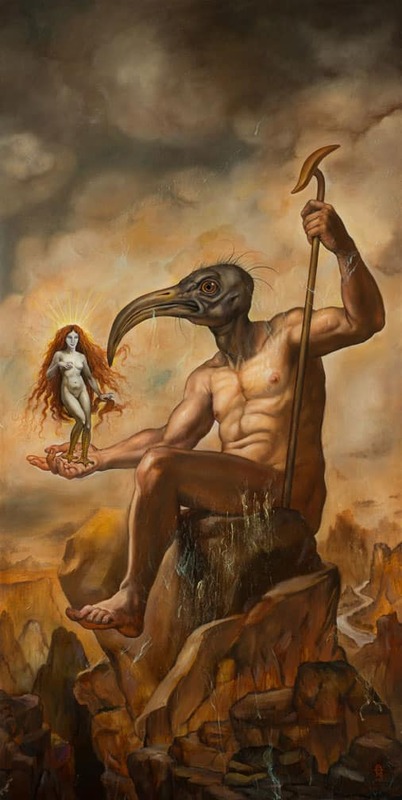 Christopher Ulrich is a Los Angeles-based artist who does beautiful oil paintings inspired by the imagery of alchemy, mythology, religion and magick—you can often see his art on display at the La Luz de Jesus gallery in Los Feliz, a counterculture nexus of the city full of the work of incredible contemporary artists. I recently had dinner with Ulrich and the crew from the Century Guild gallery, and we ended up having an intense, in depth rap session about magick and the shamanic quest into the collective unconscious. His art is absolutely astounding, and deserves wide, I mean wide attention. Madeline von Foerster (see her site here) is a New York-based artist who studied in California, Germany and Austria; she creates her works using a “five century-old mixed technique of oil and egg tempera, developed by the Flemish Renaissance Masters,” according to her site. 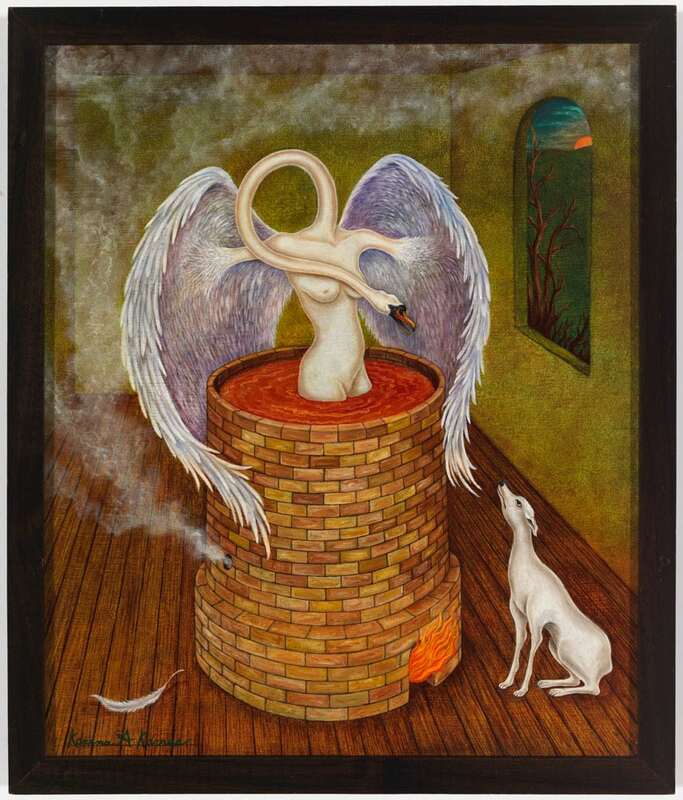 She is a highly collected alchemical artist that was named one of the “Top Contemporary Surrealists” by Art and Antiques magazine. You can buy prints directly from her here. Timothy Ely is an American painter, graphic artist and craftsman, with a focus on creating single-copy, handmade books. 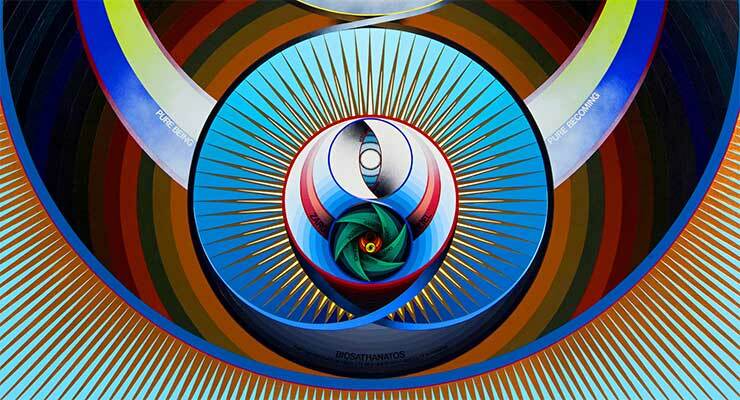 His art draws on all the big topics: religions, particle physics, alchemy, astronomy, sacred geometry and more—he even collaborated with Terence McKenna in 1992. While his books are one-offs, luckily the book Flight Into Egypt has been released in a mass edition—check it out here. Ely is represented by the Art Spirit Gallery in Idaho, which has works by him for sale here. Karena Karras is a surrealist artist from Chicago that works in the realms of alchemy, Jungian archetypes and metaphysics—Kevin Nance of the Chicago Sun Times stated that “Karras is part of a direct line that goes back to [Surrealism’s] founding in the early 20th century, connecting with [Max] Ernst and [Salvador] Dalí by way of two female Europeans who learned from their brethren and went on to find their own voices in Mexico…,” meaning, specifically, Leonora Carrington and Remedios Varo, who Ultraculture covered here. You can find out more about Karras here. Ann McCoy (site here) was born in Boulder, Colorado, and has worked extensively with explicitly alchemical themes, of which she states: “My interest in alchemy came from a dream I had as a five year old; a king was being dismembered and ground up with a mortar and pestle. When I read the tale of the Alexandrian alchemists and saw my dream in a third century text, the study of alchemy became my obsession. Check out more of Ann’s incredible art here. 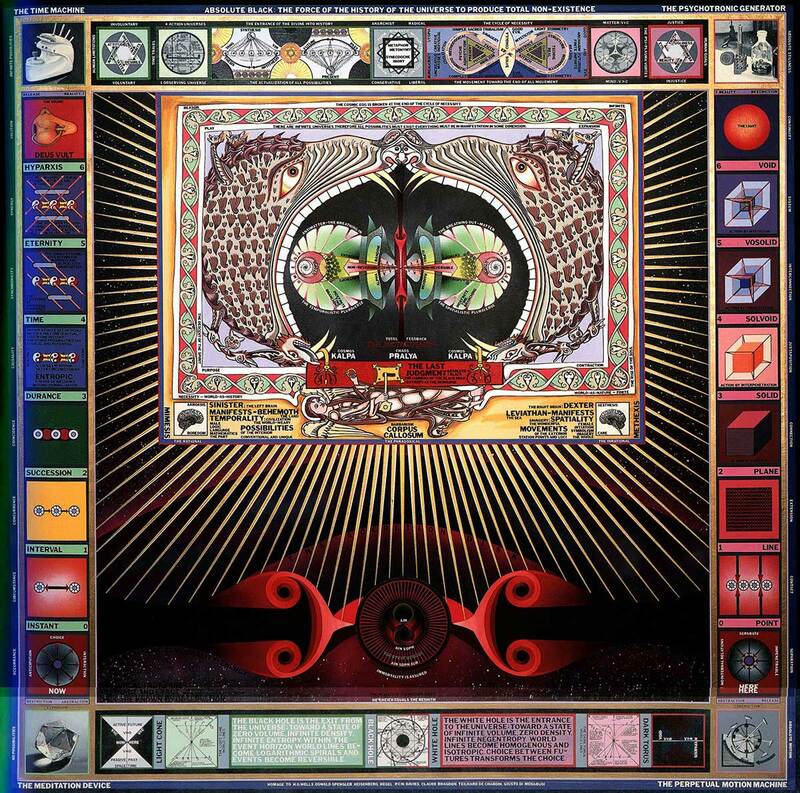 No discussion of contemporary artists would be complete with Paul Laffoley, the Boston-based artist who has been working since the 1960s to create gigantic, far-future canvases that purport to assemble the esoteric knowledge of mankind and point towards a more evolved reality. Laffoley was brought to mass awareness by Richard Metzger and the Disinformation Company, where I worked as the books editor in the early 00s; he also provided the image for the cover of my first book, Generation Hex. Here’s a great story about Paul: When I was working on Generation Hex, around 2004, I was in Boston with my college girlfriend; she was doing some shopping when I had the sudden urge to walk across the street to buy a hot dog. When I turned around from the hot dog stand to look where I had come from, I saw Paul Laffoley walking by, and of course stopped him to ask if he was, indeed, the artist. Laffoley creates art for people from hundreds of years in the future. If you can understand even a fraction of them now, you’re well ahead of the curve. Laffoley’s magnum opus—long out of print, but well worth tracking down a copy—is Architectonic Thought Forms. 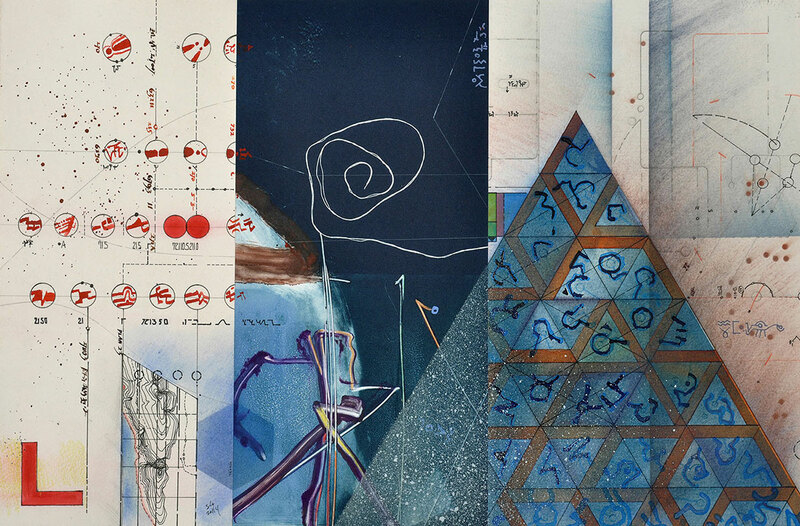 These are only a few of the many alchemical contemporary artists working today. To start learning the core skills of magick and alchemy, check out Ultraculture’s free course on chaos magick. You’ll learn everything you need to know to start a core practice of magick—and tap into the incredible realms of inspiration that inspired these seven contemporary artists to their heights of success.